Sir Oliver Joseph Lodge was a world-renowned British physicist whose first experiences in psychical research date back to 1881, when Malcolm Guthrie, the owner of a drapery shop, invited him to join his investigations in thought transference in Liverpool. Lodge was quite amazed with the results, and he began to conduct his own tests. Shortly thereafter, he joined the Society for Psychical Research (SPR). In 1889, Lodge invited the famous Boston medium Leonora E. Piper (1857–1950) to England for tests and saw that she was made comfortable in his own home. Ever the exacting researcher, he took every conceivable precaution to eliminate any possibility of foreknowledge or fraud on Piper's part. He went so far as to temporarily dismiss all of his servants and replace them with others who knew absolutely nothing about any member of the Lodge family or Piper. Although a guest in the Lodge home, the medium was kept incommunicado and was constantly watched by experienced professional detectives. With Piper's permission, her private mail was opened and read. Every possibility of her communicating with others and receiving any type of information was completely eliminated, yet Piper's spirit guides provided accurate communication in every test that Lodge devised, which helped convince the researcher that spiritistic phenomena were real. "The messages received tend to render certain the existence of some outside intelligence or control," he said. "My sittings convinced me of survival. I am as convinced of continued existence on the other side of death as I am of existence here…I say this on distinct scientific grounds. I say it because certain friends of mine who have died still exist, because I have talked with them." Five years later, in 1894, Lodge's first encounters with physical mediumship took place when he and Fredric W. H. Myers (1843–1901) traveled to the summer home of the French psychical researcher Charles Richet (1850–1935) to investigate the extraordinary Eusapia Palladino (1854–1918). Although Palladino had to be observed carefully to prevent her from resorting to trickery, Lodge was impressed with what he had witnessed. "Things hitherto held impossible do actually occur," the physicist concurred. "Certain phenomena usually considered abnormal do belong to the order of nature, and as a corollary from this, that these phenomena ought to be investigated and recorded by persons and societies interested in natural knowledge." Oliver Lodge was knighted in 1902 while he was serving as president of the Society for Psychical Research (SPR). In 1913, he was elected president of the British Association for the Advancement of Science. His fascination with Spiritualism did nothing to prevent him from accomplishing highly regarded work with electricity and with early forms of radio before Guglielmo Marconi (1874–1937). In August 1915, Lodge received what he considered proof of survival after death when, in Boston, Leonora Piper relayed what he considered to be convincing messages from Fredric Myers, who had died in 1901, and Edmund Gurney, who had passed on in 1888—two close friends and associates. Such dramatic assurances of life in the spirit world helped to prepare Lodge for the death of his son Raymond, who was killed on September 14, 1915, in his capacity as a medical officer of the Second South Lancers. On September 25, Lady Lodge sat with medium Gladys Osborne Leonard (1882–1968), who described a photograph that had been taken of Raymond with a group of fellow officers. Lady Lodge knew of no such photograph. The medium said that Raymond's spirit was insistent that he should tell Lady Lodge that in this particular photograph, Raymond was holding his walking stick under his arm. The Lodges had numerous photographs of their son, but they did not possess a single one depicting a group of medical officers in which Raymond would be included. Lodge was impressed with the emphasis that the medium had placed upon Raymond's insistence that they should locate such a photograph. Then, according to Sir Oliver's report on the case (Proceedings, S.P.R. Vol. XXIX), on November 29, a letter was received from a Mrs. Cheves, who was a stranger to the Lodges, but who was the mother of a friend of Raymond's. Cheves informed the Lodges that she had half a dozen photographs from a sitting by a group of medical officers in which Raymond and her son were present. Cheves inquired if the Lodges would like a copy of the photograph. Although Lodge and his wife responded immediately and enthusiastically, the photograph did not arrive until the afternoon of December 7. In the interim, Lady Lodge had gone through Raymond's diary, which had been returned from the front, and had found an entry dated August 24 which told of such a photo having been taken. In his report for the Society for Psychical Research (SPR), Lodge noted that the photograph had been taken 21 days before their son's death. "Some days may have elapsed before [Raymond] saw a print, if he ever saw one," he wrote. "He certainly never mentioned it in his letters. We were, therefore, in complete ignorance of it." While the Lodges were awaiting the photograph from Cheves, they visited another medium through whose spirit control Raymond gave them additional details concerning the group picture. Now, it seemed, Raymond was not so certain he held his walking stick, but he confirmed that there were a considerable number of men in the photograph, including two who were friends of his. These two men were prominently featured standing behind Raymond, one of whom annoyed him by leaning on his shoulder. When the photograph was delivered to the Lodge home, Sir Oliver and Lady Lodge noticed at once that it offered a poor likeness of Raymond, but provided excellent evidence that their son had communicated to them from beyond the grave. The walking stick was there, though not under Raymond's arm, as the first medium had said. The fellow officers Raymond had named through the second medium were in the photograph and the general arrangement of the men was as both mediums had described it. "But by far the most striking piece of evidence is the fact that some one sitting behind Raymond is leaning or resting a hand on his shoulder," commented Lodge in his report. "The photograph fortunately shows the actual occurrence and almost indicates that Raymond was rather annoyed with it, for his face is a little screwed up, and his head has been slightly bent to one side out of the way of the man's arm. It is the only case in the photograph where one man is leaning or resting his hand on the shoulder of another." Lodge once again contacted Cheves and learned where he might obtain prints of other photographs that had been taken at the same time. Upon examination of all accessible prints, Lodge found that the basic group pose had been repeated with only slight variations for three different photographs. The Lodges felt the evidential value of the communication had been greatly enhanced by the fact that one medium had made a reference to the existence of Raymond's last photograph, and another medium, unknown to the first, had supplied the details of the photograph in response to Lodge's direct question. In his My Philosophy (1933), he wrote: "I am absolutely convinced not only of survival, but of demonstrated survival, demonstrated by occasional interaction with matter in such a way as to produce physical results." 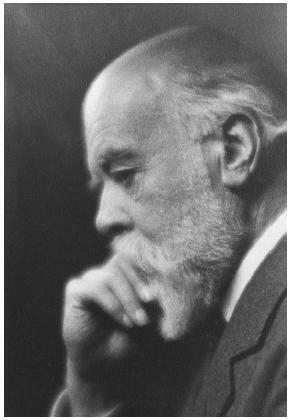 Among the books written by Sir Oliver Lodge are such titles as: Man and the Universe (1908); Science and Religion (1914); Raymond or Life and Death (1917); Raymond Revisited (1922); Science and Human Progress (1927); Why I Believe in Personal Immortality (1928); The Reality of a Spiritual World (1930); and My Philosophy (1933).